Once upon a time – before the invention of Facebook, Google, serial monogamy and delayed marriage – ex-boyfriends disappeared from a woman’s life forever after that final hanging up of the phone (and cell phones mean one can no longer slam down the receiver in disgust.). Out of sight, out of mind. Goodbye, good luck and good riddance. But no more. Now people are expected to stay friends (at least on Facebook) with their exes. It’s polite, it’s adult, it’s what’s done. My never-married friend Pam has stayed friends with most of her exes, telling me that just because the romance was over, it didn’t mean she stopped caring for the men she dated. I’ve been married for 25 years and lost track with most of the guys I dated in college. Hopefully the restraining orders have expired. 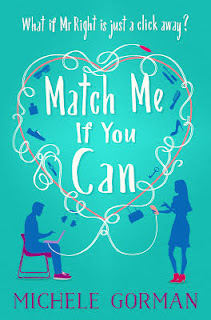 This “stay friends” expectation is the underpinning of Michele Gorman’s latest romantic comedy, Match Me if You Can. Catherine and Richard are divorced, but he still considers her his best friend – so much so that they share a company. RecycLove.com is more than just a website – it’s a matchmaking company and even a make-over service. The catch, however, is that singles can’t join by themselves. They need to bring along an ex-boyfriend or girlfriend, both to vouch for their character and to offer a critical assessment. Unfortunately for Catherine, Richard doesn’t need their company’s services – he’s just become engaged to Magna, a 23-year-old wealthy Hungarian model, who insists on becoming Catherine’s new business partner. To prove that she doesn’t need Magna’s help in her business, Catherine convinces her housemates – junior architect Rachel and greeting-card writer Sarah – to sign up for the service. Rachel brings along her ex-boyfriend, current co-worker James – with whom she’s competing on a big project at work. Sarah, who’d rather be baking or taking care of her disabled younger sister Sissy, cajoles an ex-boyfriend who faults her for being a couch potato. In a subplot, Catherine and Rachel plot to get Sarah accepted on a baking reality show. Although the novel is equally Rachel and Sarah’s story, Catherine is the dominant character, and her dilemma is the most compelling. Magna is obnoxious and arrogant, but Richard’s insistence that Catherine is his best friend means she’s stuck with his fiancée as her partner and helping them plan their wedding. And ironically, this friendship demonstrates the fallacy of the “stay friends” directive – Catherine’s friendship with Richard is holding her back from other relationships. Even without driving story, Rachel and Sarah are both easy to root for. Rachel’s mother is a famous architect, and she’s desperate to prove herself without her mother’s help, all the while competing with a man she seems to still have feelings for. And Sarah needs to find a home for Sissy before her current group home closes. Romance, while nice, has to take a back seat to other concerns in these women’s lives. 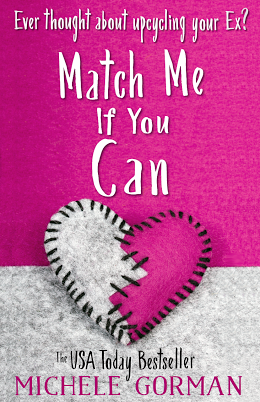 "Match Me" firmly falls into the category of chick lit, but it’s refreshing that none of its three heroines puts the wants and needs of a man before their own. Yes, it’s nice to have a man, but having real friendships, a strong career, and self-confidence are the vertebrae in the spine of life. The novel is a bit longer than it needs to be, but it’s definitely a nice addition to the genre. And reading it is a much better way to spend time than stalking exes on Facebook. Thanks to Notting Hill Press for the book in exchange for an honest review. Awesome review. I am best friends with my ex-husband. This sounds fascinating ... I met my current boyfriend on OKCupid. Thanks for the review!